The First Hostage picks up where The Third Target leaves off. Isis takes the President of the United States hostage and the King of Jordan coordinates a search and rescue mission for the president. It’s a great read and an excellent story. The sequel comes out early 2017. "The president of the United States...is missing." 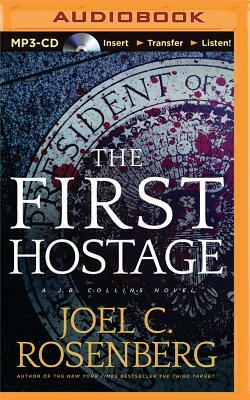 Three years before Clinton and Patterson, another New York Times bestselling author of thirteen international thrillers, Joel C. Rosenberg, posed this chilling scenario: What if the Islamic State captured the most valuable hostage in history? Award-winning journalist J. B. Collins, reporting from the scene of a devastating attack by ISIS terrorists in Amman, Jordan, puts the entire world on high alert--the U.S. president is missing and presumed captured. With Israeli and Palestinian leaders critically injured and Jordan's king fighting for his life, the allies are reeling and hopes for the peace process are dashed. As the U.S. government faces a constitutional crisis and Jordan battles for its very existence, Collins must do his best to keep the world informed while working to convince the FBI that his stories are not responsible for the terror attack on the Jordanian capital. And ISIS still has chemical weapons. Struggling to clear his name, Collins works frantically with the Secret Service to locate and rescue the leader of the free world before ISIS's threats become a catastrophic reality.